Back by popular demand, and inspired by one of the most powerful messages of our lives. Artist, designer Toofly decided to bring back this slick and sharp LOVE HEART necklace in a fire engine red, and classic black. Originally released on Valentine's Day last year, they sold out in both sterling silver and 14K gold! Now these lovely heart classics are available at a fraction of the price. Laser cut acrylic with an 18″ sterling silver chain. ARE YOU READY TO SPREAD LOVE? 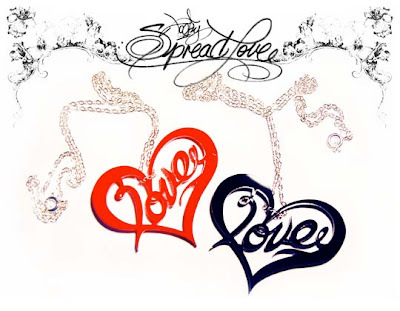 With every love heart sold $1 will be donated to www.yele.org to help Haiti families rebuild.